Getting to know the fingerboard • Simply-fingered profound chords • Bass lines and altered chords • Moveable open chords • Accompanying relaxation methods • Blues variations and solos • Intuitive strumming & fingerpicking • Changing styles & building/tapering intensity • Percussion sounds while playing • Instant methods of open tuning in any key • Adaptive methods for clients without special equipment • One-finger gorgeous chords for accompaniment and added melodies • And more! “Fantastic course, from the teaching to the pace to the usable material and examples of how specific techniques can be used for therapeutic purposes. I found it so valuable and am glad I have the handouts to continue practicing. This is really what I needed—the right way to think about the guitar instead of getting locked into the same standard chords. I was able to begin using what I learned right away, and also have some skills to continue practicing that I look forward to implementing in sessions. I appreciated the specifics she included as to how the musical techniques she taught corresponded to aspects of psychology and how they could be used in treatment. I also liked when she demonstrated how specific progressions could be used in a song.” ~Melanie I. “Very helpful course, filled in some gaps in my knowledge. 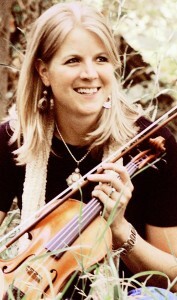 I appreciated the connection to music therapy situations.” ~Charles G.
“The most useful skill I learned for my practice was the use and flexibility of the bar chords to add interest to the music used in therapy sessions.” ~Laryssa C.
“This was an excellent course, excellent design, and excellent use of online instruction. I was beyond satisfied with the quality and quantity of instruction material. The instructor had a very relaxed style and presented an excellent foundation of guitar skills. My favorite moments though, were when she reached beyond the skills to talk about therapeutic application. She was able to synthesize the material with clinical insight in such an effortless and thought provoking way. Her knowledge base is well evident and she encouraged me to find ways to utilize the guitar as an extension of my musical self and think about music in terms of the guitar. I would gladly recommend this course to anyone looking to further develop their guitar skills beyond entry level.” ~Ryan C.
"Awesome! I'm so excited that I learned this! I once asked my guitar teacher to help me play more than just the first four frets of the guitar. He taught me a classical piece, which I really like and still play. But what I was really asking him for was something more like the "unbarred" bar chords from GSL. I wanted something where I could learn a few basic concepts and then create what I want; something more intuitive. Maybe if he had been a music therapist he would have known what I was asking. With the GSL course I have been presented with ideas on how to incorporate the new skills into music therapy sessions. 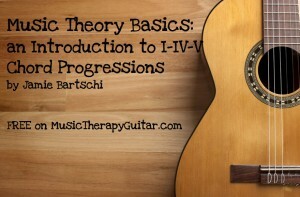 Having a guitar course for music therapists, taught by a music therapist, is invaluable. Jamie is a talented guitarist and talented teacher. She breaks down new skills into small steps and pays attention to detail when presenting the lessons. I highly recommend this course!" 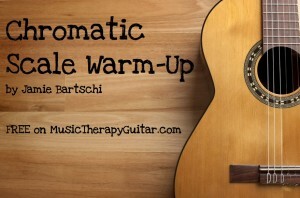 ~ Cathy C.
Join Jamie Bartschi, MMT, MT-BC for a quick lesson in getting familiar with your fingerboard in the "Chromatic Scale Warm-Up" video. Also, for those interested in taking the GSL courses who haven't had music theory classes yet, watch the "Music Theory Basics" video for a quick introduction to the concepts you'll need in the course. > Earn CMTE credits whenever and wherever you want!